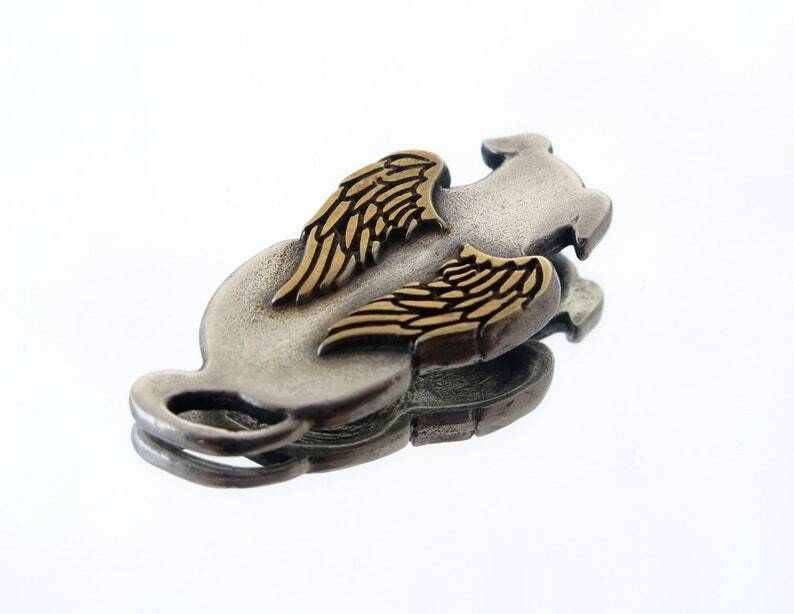 Silver and gold dog necklace, special art pendant- a dog with angel's wings. This dog pendant is jewelry for dog lovers. Masterfully crafted, the pendant is sterling silver, and the wings are gold plated with 14K gold, and the outside is oxidized and polished for superior quality. The mix of materials ensures you can coordinate this piece with a mix of your other jewelry. This whimsical charm is ideal for a heartfelt gift for any special occasion, and is sure to appeal to all ages. Dog angel jewelry is OOAK artwork. Materials: Pendant, jump rings and clasp are 925 sterling silver, the wings are goldplated. Length of the cord: 16’', 17'', 18’’, 19'', or 20’’ (includes clasp)- just write the length in notes when checkout. Your pendant will be packaged in a gift box. *** Each pendant is OOAK because it is handmade, so the finished work by your order may slightly differ from the one pictured. If you wish I can take a picture and send it to you before shipping, so you can see your pendant! (please leave a note when you checkout). *** I love to make custom orders if you wish something special inspired of this artwork. *** The order will normally be ready in 3-7 business days.